« Expectations of Happiness Blog Tour with author Rebecca Ann Collins, & Giveaway! While there is more of a mystery in this bppk than in many of Heyer’s, I’m not sure that I’d agree that it is “more of a mystery than a romance”. The gentle flowering of Nell in response to John’s attentions, and the fact that his height and overall size make her (as a tall woman) feel attractive and desired for the first time in her life, makes their relationship one of my favorites. I agree that John and Hugo of The Unknown Ajax have many similarities, to the extent that they feel like the same person to the reader (especially given the sense of humour that they share). It is to Georgette Heyer’s credit that the other characters in both books (especially the heroines) are so different that the hero’s relationships with everyone else are very different in the two books. Excellent review and I’m a bit surprised because having read at least 17 or 18 of her superlative stories, I have never heard of THIS one. Somehow, some way, I’m going to read ALL of them, including this one! Thanks! Thanks for the recommendation. Discovering another GH is like coming upon a little lost treasure.This mystery sounds perfect timing for this Halloween season. I’ll add to my MUST READ list. This is my favourite Heyer of all time I think: certainly always in my top five. An excellent summation. 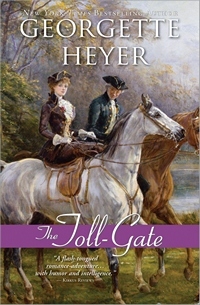 The delicacy of touch of the way Heyer draws her secondary characters is particularly evident in this book, and the delightful way she handles children comes through in young Ben, the Toll-keeper’s son. I thoroughly recommend it. I am so glad one of the lesser know Georgette Heyer books is getting its place in the limelight. I love this one just because of the hero and re-read it from time to time. I’ve read her 1930s mysteries. I will have to get this one. The mystery element in this appeals to me – and the dominant character is a strong hero. Thanks for the great review Laura! I haven’t read this for years, but I remember enjoying it for it’s adventure and mystery, as well as the romance. Must find a copy so that I can read it again! This sounds like a wonderful book. I enjoy Heyer’s romances, but as a mystery lover, this sounds even more up my alley. I’ll have to keep an eye out for it. Keeping my own list of characters right from the first page of any work is a necessity for me, alas, so this was very useful. TOLLGATE is next, thanks!